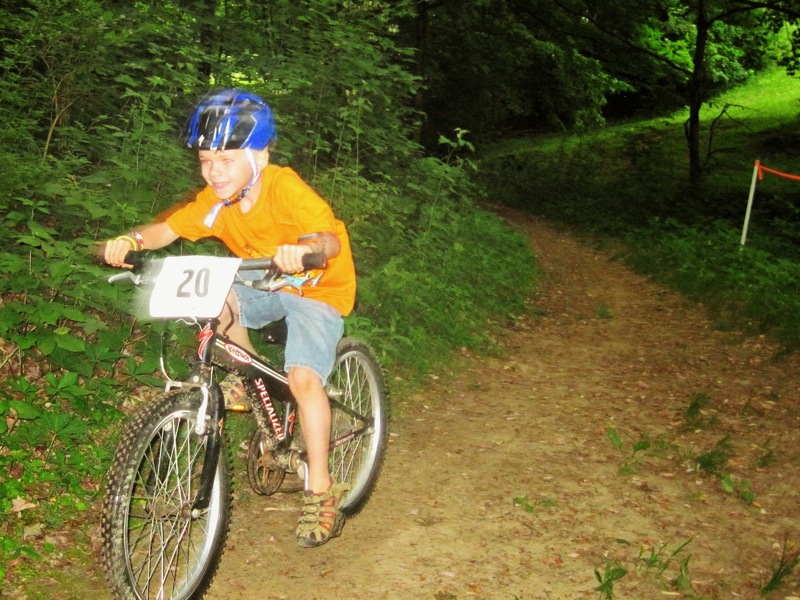 My husband enrolled the boys in a free kids' bike racing series this spring. I missed the first two races because of work. But I got to see the last one. Reid placed in the first two races (2nd and 3rd) but Cort did not. Cort was very jealous. 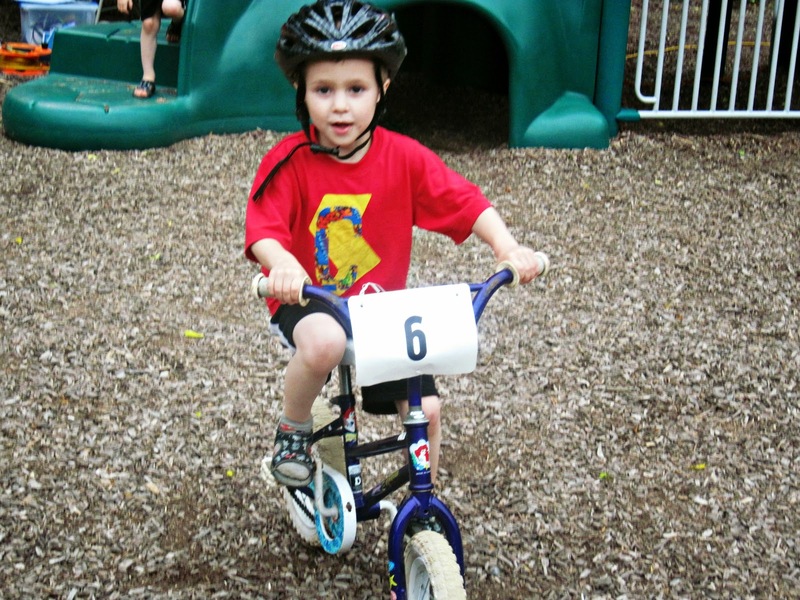 After the first race, he tried to talk Reid into riding slower, so that he could win instead. When he didn't, Cort was mad that Reid didn't let him win. Cort really wanted a medal. When the race started, there were 15 kids total in the twins' age group. Reid had the lead from the start. Here he is coming around the curve before the final stretch. But then, something crazy happened. Cort started pushing harder. 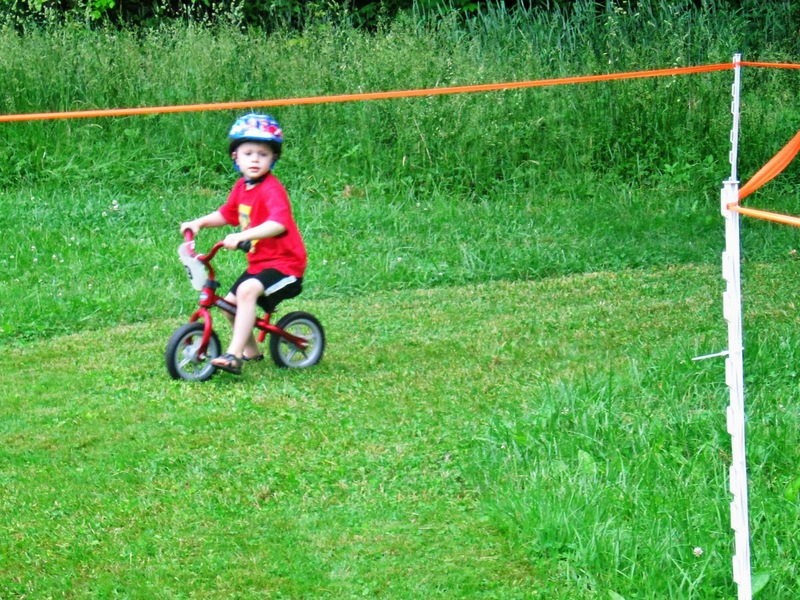 Then he jumped off his bike and started running and pushing the bike (the finish is on an uphill). And he started catching up. Reid had no idea Cort was behind him. The determination on Cort's face was captivating. All the parents stopped to watch the twins battle it out, and there was a stunned silence as the two of them went neck to neck for the finish. I was so shocked that I forgot to take pictures. In the end, Reid won by about a foot. But Cort was thrilled. After he crossed the finish line, he said, "I get a medal this time, right?!". Cort got a second place medal, and Reid got first place. In addition, Reid was the overall winner for the entire series, and Cort was the second place overall winner. Next year, the twins will be in the next age group up, and the competition is a little more stiff there. It'll be interesting to see how they fare. Afterwards, there were hot dogs and chips for all the kids, to celebrate. We are looking forward to next year's series! That is a neat thing, I don't remember seeing that when Carrie was that age. I foresee dueling trophy-cases in the future! I am so impressed with all the boy's biking skills. I am so glad Cort got a medal. How fun! I love that they do this for the little ones. I haven't seen anything like that around here! Congrats to all 3 for working so hard to get to the finish line! Oh how fun! Dirt bike races for kids! We keep thinking of getting our oldest daughter involved in Juniors class racing (road). That's a pretty cute story. They'll do well in other competitions I think! What a story! So funny that he asked him to slow down! But all ended well! Wow! That must have been fun to watch. Sounds like Cort was really determined. Congrats to the twins! I'm like Pierce--I just love to ride. Larry and I plan to go riding on Thusday morning. A little healthy competition can be rewarding! Good for all of the boys! The twins will probably push each other to be the best they can be. Congrats to them for coming in 1st and 2nd. Good for Pierce having so much fun. Good for them! What a neat things for the boys. Didn't even know such things were available for little ones. LOL but then I never had kids so I am not up on all that :O). I think I missed something you said you missed some races due to work. You have gone back to work apparently. After a year of working outside the farm. I have now cut it back to working from home. I do all the online store sales for the shop I was working at, most of it I can do from home. I go in at least once a month to take photos and list new fabrics for sale in the online store. And he got second place all on his own!! That is much better than letting you win. :) Congratulations to them both! 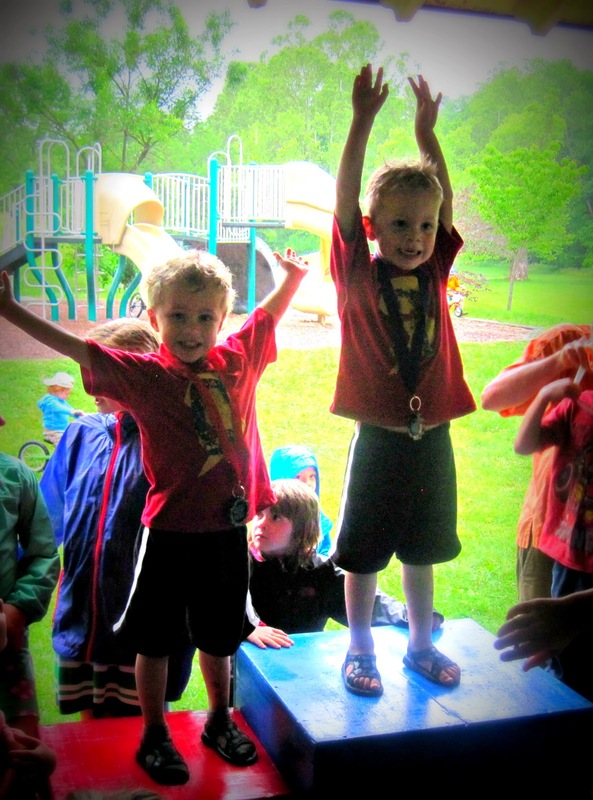 Congrats to the twins on their medals, and to Pierce for participating and getting the big reward of enjoyment. It must be very excited to see the competition between the twins.Congrats to them! My kid also loves cycling. It is good for kids health! How fun for them! We love these stories! They all worked really hard, AND had a ton of fun! Congratulation to your twin and Pierce. They are good biker. Competition is important for kids... Sometimes I feel as if our society these days is getting rid of competition --since some people get hurt... I read that one school cancelled an awards ceremony for those who got really good grades --for fear that other kids would be upset... HELLO---that is not right. Competition is just part of life. That's how kids learn.. There are times when one wins and another loses. That's just life. I love it that your kids participated!!!!! How funny the twins are….so competitive. ;) Glad they both had a good experience. Loved seeing Pierce's joy….such wonderful boys you have.